I don’t want even a speck of light entering my room,” the 17-year-old version of me screamed, teeth clenched. “Please don’t open the windows, and draw the curtains, amma!” My mother obeyed and left me alone. Windows shut and curtains drawn close, my room turned into a dark hole—a stark contrast to the otherwise well-lit and ventilated abode I maintained. Migraine starts at a young age of 12-13 years and goes on till 50-55 years. This is the natural design of migraine in most patients. I lay on my bed, face down, eyes shut and hands pressed against the back of my head. Even with my eyes closed tight, I saw white, worm-like figures moving. “Am I hallucinating?” I wondered. Bespectacled for most of my life, I had never gone through such a throbbing headache. I was in class 12 then. Like any student gearing up for the ‘decider’ game of her life, my regular day involved spending almost 12 hours at school and entrance coaching classes, cramming textbooks as thick as the Bible. Days and months looked similar. With pressure mounting, I was going through the most difficult and strangest phase of my life. Easily irritable, I would get upset at the drop of a hat. And, the headache would frequent me at least once a week. The splitting headache would start from the temples and slowly spread ear to ear. It felt as if I was wearing an invisible, tight headband inside my skull. Initially, my parents and I brushed it off, blaming my altered sleep patterns or change in eye power. However, I had also started losing my appetite and was nauseous during the bouts of headache. Often, the pain subsided after sound sleep, but my head would still feel heavy, as if hit by an iron rod from behind. Unable to cope, I visited my ophthalmologist. But the eye power was the same, leaving us bewildered. Fortunately, he referred me to a neurologist, who did not take long to draw his conclusion—I had migraine. I did not have the slightest idea of what migraine was. The doctor comforted me saying that migraines were common among teenagers, especially girls of my age. Since the attacks were frequent and interfered with my daily life, the doctor prescribed a tablet, usually given for mild headaches, that I had to take daily for the next two years. Thus began my tryst with migraine, the most common primary headache disorder. Anybody who has one-sided or both-sided headaches, severe enough to interfere with her day-to-day life, and if the neurological examinations are completely normal, then it is migraine. “Ninety per cent of patients that I see have migraine, but they have no idea that it is migraine. They simply say, ‘I have a headache',” says Dr Harirama K. Acharya, senior consultant and head, neurology, Narayana Health, Bengaluru. Migraine is a highly misunderstood, poorly recognised and inadequately treated medical disorder. In fact, many people do not even consider the option of treatment, saying the disorder runs in the family or mistake it for sinus headaches. 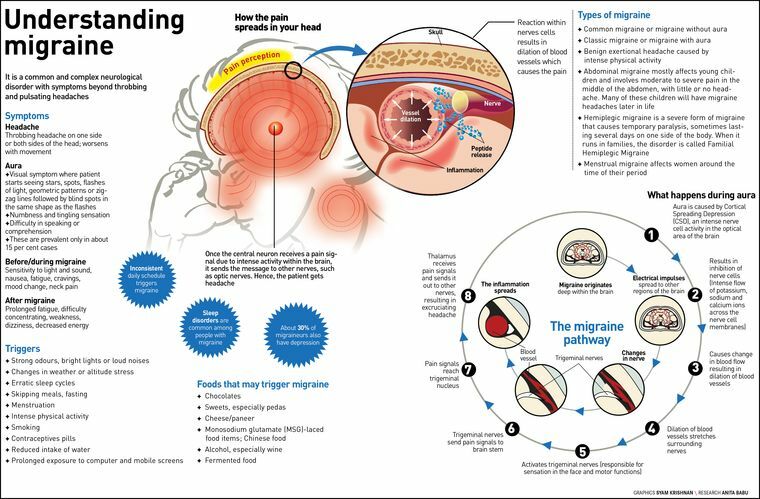 Earlier, migraine was thought to be a vascular disorder caused by simple dilation of blood vessels that stretches the surrounding nerves and results in the excruciating headache. However, with advancements in functional imaging and molecular biology, it is now well-established that migraine is a disorder of the brain. “It has to be addressed as a complex neurological disorder with symptoms beyond headaches,” says Dr K. Ravishankar, consultant in-charge, The Headache and Migraine Clinic, Jaslok Hospital and Research Centre and Lilavati Hospital and Research Centre, Mumbai. “Migraine can affect any part of the central nervous system or different areas of the brain, each of which can have different symptoms. Because nothing of this is visible on either a scan or during a test, people tend to mistake migraine for a psychological disorder. However, it is a biological disorder and not a psychological one.” It is a brain disorder that can be controlled. One of the most common misconceptions is that migraines affect individuals who cannot cope with stress. But Dr Agnibha Maity and Dr Anup Kumar Bhattacharya, in their paper published in Monograph on Headache, say that most migraineurs cope well with stress but have attacks when they relax. At the same time, stress may induce other triggers for migraine such as missed meals, poor sleep and muscle tension. Often, when every test turns normal, the patient ends up at a psychiatrist because more often people think that the problem is in the mind, owing to stress. Misdiagnosis is another issue. Migraine may coexist with many disorders. Usually, the patient might be diagnosed with depression or anxiety-related issues and given medication to treat these disorders. The patient might feel better for a while because a few medicines for migraine are antidepressants and anti-anxiety tablets. “Often, migraineurs have a 30 per cent chance of having associated anxiety or depression. But then, the psychiatrist would only be treating the anxiety or depression and not the migraine,” clarifies Ravishankar. The larger danger is that in such cases, migraine, which would often be the root cause of the problem, might go undetected in the patient, worsening the condition in the long run. Similar is the connection between migraine and epilepsy. Hence, migraineurs should not self-medicate. Head blocks: Sindhu Jose, 31, has been suffering from migraine since she was 12. For her, the triggers include stress, hunger, lack of fresh air, sleeplessness and some perfumes. Migraineurs often complain about frequent throbbing or pulsating headaches. They usually feel an irritating, pricking sensation in their head, which may or may not always be associated with nausea or vomiting. The headache lasts between 4 and 72 hours and even longer, if untreated. 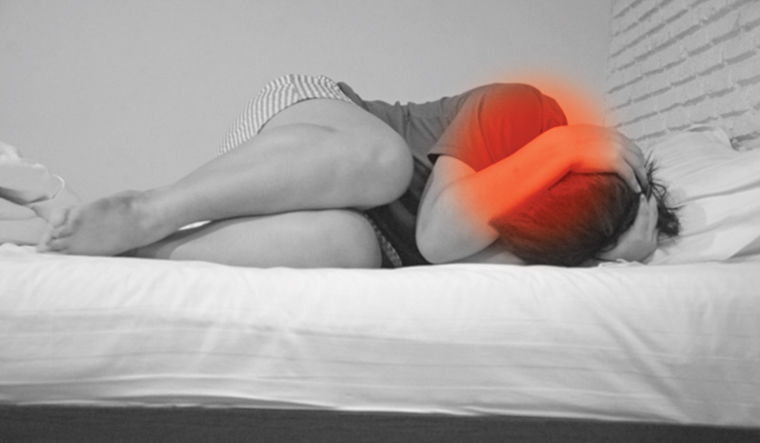 Migraines occur most frequently in the morning, especially upon waking up. However, symptoms vary from person to person. 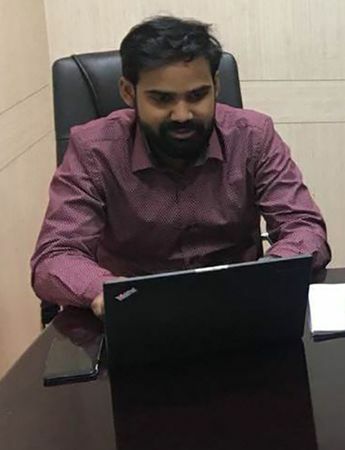 Delhi-based public health professional Sachin Salim started getting migraine headaches a year into his career, courtesy frequent use of computers. “It starts with sparkles in the eyes, blurring vision and a point headache, which soon becomes a heavy headache, accompanied by nausea. By this point, I would not be able to open my eyes,” he says. For Salim, the disorder is hereditary—his mother is also a migraneur. Migraine has two major subtypes: migraine without aura (common migraine) and migraine with aura (classic migraine). Aura is most commonly a visual symptom, where the patient starts seeing stars, flashes of light, geometric patterns or zigzag lines followed by blind spots in the same shape as the flashes. These constitute the visual aura. About 15 per cent of patients may experience slight tingling or numbness on one side of the body or even speech impairment. These are called sensory and speech aura. The visual/sensory/speech aura usually preludes a headache. Hence, patients first complain about a sudden lack of vision and then the headache. Soon the patient’s vision recovers, but the headache persists. Other common symptoms for migraines with or without aura are nausea and increased sensitivity to light, sound, noise and odour. Sometimes, even routine physical activity, movement, coughing or sneezing can worsen the headache. Migraine with aura is less common and is seen only in 10 to 15 per cent of patients, while migraine without aura affects about 85 per cent. The symptoms of migraine without aura include pain on one side of the head, along with blurred vision, mood changes and fatigue. On the other hand, migraine with aura includes visual aura and other neurological symptoms that appear about 10 to 60 minutes before or during the actual headache and usually last no more than an hour. “Individuals may temporarily lose part or all of their vision,” says Acharya. “Other classic symptoms include trouble in speaking, an abnormal sensation, numbness or muscle weakness on one side of the body, a tingling sensation in the hands or face and confusion.” Vomiting and loss of appetite are also common. After a migraine attack, one may feel exhausted or drained out and may seem to lack concentration. By the time I graduated, the frequency of migraine attacks had come down to once in every three months or so from once every week in class 12. During my graduation, I came across Shiyon Sunny, a hostel mate. At least once a week, she would skip food and be confined to bed all day, with a piece of cloth tightly tied around her head (migraineurs often do this as it gives some kind of relief from the pain). Sunny had tried both allopathy and ayurveda, but the attacks continued. However, in two years she would tell me that the number of migraine attacks had come down and she had discontinued her medicines. The high incidence of migraine during prime adolescent age hints at the involvement of hormones. Sindhu Jose, 31, has been suffering from migraine since she was 12. For her, the triggers include stress, hunger, lack of fresh air, sleeplessness and some perfumes (including car fresheners). Like its symptoms, migraine triggers can also differ from person to person. Other common causes include skipping meals, erratic sleep timings and dietary triggers such as food with MSG or excess cheese, Chinese or fast food, paneer, wine and fermented food. Stress-inducing education system is another causative factor. Thanks to early morning school hours, kids often have only a glass of milk for breakfast. Then come board and entrance exams. And, kids find it difficult to cope with the stress, which may trigger migraine headaches. With changing lifestyle and work culture, migraine has become more common now. Persistent exposure to computer or mobile screens can also wake up the dormant migraine condition within the brain. 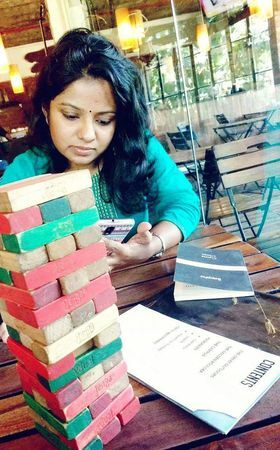 This explains the high rate of migraine patients among IT and BPO employees as these professions come with the lethal combination of erratic shift timings, stress, fast food, computers and social media. With advancements in research, it has been established that migraine is not just a vascular disorder, but one that involves the brain and the nervous system. There are still many unanswered questions, like how, say, exposure to sunlight can trigger migraine. On the other hand, science has been able to establish what happens inside the brain during a migraine attack, especially in the case of migraine with aura. Aura is caused due to a mechanism called the cortical spreading depression (CSD). Following a trigger, there is a wave of intense nerve cell activity that starts from the area that controls the vision and spreads across the brain or the cerebral cortex of the patient. With continued exposure, the brain enters a hyper-excitable state, followed by prolonged inhibition of the nerve cells. In addition, there is a flow of potassium, sodium and calcium ions across the nerve cell membranes when this happens. This phase of hyper-excitability is followed by inhibition, which leads to changes in the blood flow and consequently a visual aura. A few hours later, the patient might start feeling a throbbing, pulsating headache. In some, instead of the aura, CSD might take place in the subcortical region of the brain. These neurons activate the trigeminal nerve, the most important pathway that transmits the pain of migraine. These pain signals go into the trigeminal nucleus in the brain stem. And from there to the final pain centre in the brain—the thalamus. That is where the patient perceives the pain. Brain stem has nuclei that are responsible for the symptoms surrounding the migraine. The abnormal excitability in this region has been established through PET scanning. Meanwhile, the genetic basis of migraine has been established only in certain type of migraines like hemiplegic migraine, more common in Europe. This rare condition can have all features of migraine, in addition to reversible motor weakness of one half of the body. Hereditary, hemiplegic migraine is also called familial hemiplegic migraine (FHM). The genes have been identified clearly for FHM-1, FHM-2 and FHM-3 types. When the migraine is not accompanied by family history, it is called sporadic hemiplegic migraine (SHM). Migraine is a predominantly female disorder and is three times more common in women. Three of every four migraine patients are women. The condition is usually seen in the age group of 15 to 40 years. Doctors say women have a one-year migraine prevalence that is nearly three times that of men (17 per cent vs six per cent). Similarly, the lifetime incidence of migraine in women at 43 per cent is more than two times higher than that of men at 18 per cent. Chances of one getting migraine increases if he or she has a first degree relative with the same disorder. Migraine occurs more in females because of oestrogen. Often, migraine starts off with the onset of periods—menarche. Girls in the age group of 13-15 years will have more headache than boys. Migraine attacks also often spike with the intake of oral contraceptives, during and post pregnancy, onset of menopause and hormone replacement therapy. Dr Arindam Ghosh and Bhattacharya, in their paper ‘Migraine and Women: Issues and Challenges’, published in Monograph on Headache, claim that menstruation-related migraine begins at menarche in nearly 1/3rd of women and affect 60-70 per cent of women during their lifetime. However, pure menstrual migraine that recurs with each period affects only 7-14 per cent of women. Clinical studies have postulated that drop in oestrogen was the cause of migraine in vulnerable women, note Ghosh and Bhattacharya. Studies have concluded that elevated oestrogen levels during second and third trimester of pregnancy or its complete withdrawal (as in menopause) protect against migraine without aura. Although many women have menstrual-triggered headaches, there is no evidence to suggest that the hormonal levels are abnormal in these women. On the other hand, doctors believe that a migraine-prone nervous system is unusually susceptible to hormonal fluctuations. One of the most pressing issues of migraineurs is the severity of the pain that is capable of halting your normal day or life. “Often, productivity gets affected. Even if your boss and colleagues are understanding, the kind of depth in reviewing or conceptualising (required for my work) goes for a toss,” says Salim. Migraine starts at a young age of 12-13 years and goes on till 50-55 years. This is the natural design of migraine in most patients. However, one can control migraine and the way it interferes with daily life. Usually two types of drugs—abortives and preventives—are prescribed to deal with migraines. While abortives are primarily analgesics that stop migraine headaches, preventives ensure that the next attack is not easily triggered. Ravishankar says that there are no drugs that are 100 per cent successful in all migraine patients. The success rates of most preventive drugs is just around 60 per cent. Patients with occasional mild to moderate migraine may benefit by taking aspirin or paracetamol or other non-steroidal anti-inflammatory drugs at the start of an attack. However, such prescriptions come with a warning. Doctors also advise small amounts of caffeine in the early stages. However, for people who suffer from moderate to severe migraines, stronger medications are usually prescribed. “Triptans are the most commonly prescribed medications for the treatment of moderate to severe migraine headaches. Triptans are available as tablets, nasal sprays and injections. 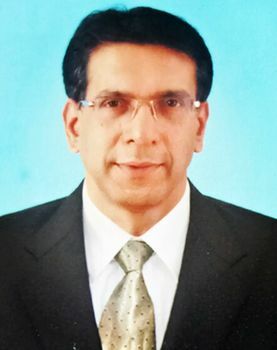 Sumatriptans, Rizatriptan and Zolmitriptans are some triptans available in India,” says Acharya. Until now, all drugs for migraine have been borrowed from other areas of medicine and neurology. For instance, anti-epileptic, anti-hypertensives and antidepressants often work against migraines. However, according to Ravishankar, 2018 has been the golden year of migraine treatment as a new set of drugs has been launched. This is thanks to the development of CGRP (calcitonin gene-related peptide) blockers that can block CGRP (the neurotransmitter associated with transmission of migraine pain) and CGRP receptors (see guest column). Quite often, patients in India opt for ayurveda when allopathic medicines fail to work effectively. However, ayurvedic medicines also focus on controlling or decreasing the frequency of the attacks and cannot cure migraine completely. In short, migraines are more common than you think, and while it cannot be cured completely, identifying it at the right time and with appropriate treatment, it can be managed better.